Remove the insert and tell your doctor right away if any of these unlikely but serious side effects occur: eye pain, persistent eye redness/irritation, swelling in or around the eyes, vision changes. Before using this medication, tell your doctor or pharmacist your medical history, especially of: eye surgery/injury/infection/disease. Before using this medication, tell your doctor or pharmacist of all prescription and nonprescription/herbal products you may use, especially of: other eye medications. 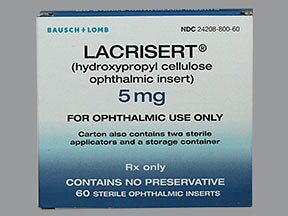 Are you taking Lacrisert Insert? Are you considering switching to Lacrisert Insert? How long have you been taking Lacrisert Insert?